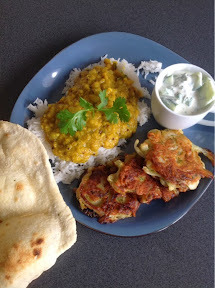 Today was a good day to make my favourite dhal, which I have posted before. However, for some insane reason I decided to make dhal, naan bread, onion Bhajias and raita. It was delicious…. Even if it was a little chaotic in the kitchen. 1. Slice the onions into half circles. Smaller would be better for smaller ones, but I decided to make big ones. Sprinkle with salt, and sit in a colander while you do the rest. These need at least 10 minutes to lose as much moisture as possible. 2. Put the garlic, coriander and chili in a food processor. You can add a little ginger if you like as well. Blitz until everything is a small, uniform size and shape, but not liquidised. 3. Sift flour into bowl. Add the cumin and the green stuff from the food processor. 4. Add oil, and water and stir together into a thick-ish batter. 5. Place oil in a fry pan to heat (or use a deep fryer. I don’t have one, so I use a pan). 6. This gets messy… But give it a go. Take about half a handful of onions from the colander (which should be pretty dry by now), and place in the batter. Using your hands form a battered ball of onion. Place into hot pan. Work quickly, which will be messy, but it washes off easily… Just don’t wipe your eyes. 7. When golden brown on one side, flip the Bhajias over and cook again on the other side. 1. Dice the cucumber and chop up the mint and coriander. 2. Throw into medium sized bowl. Pour over the lemon juice. 3. Mix in the yogurt. You can season with salt and pepper if you like at this point. Use as a dip for the onion Bhajias.